There are many beautiful fall wedding centerpieces available. This beautiful season lends itself to bold and beautiful centerpieces. Brides with fall themed wedding will have no shortage of ideas available for beautiful and elegant fall wedding centerpieces. When fall first comes to mind, many think of beautiful colors. These colors include red, orange, brown and gold. These colors can be included in wedding to convey an elegant fall theme. There are several ideas that brides can use to integrate these beautiful colors into their overall wedding look. One idea that brides can use to create fall wedding centerpieces is to create harvest themed decor. Centerpieces can be constructed from fall flowers, leaves and foliage, and ornamental gourds and pumpkins. Consider using a variety of fresh fruits and vegetables to further signify a bountiful harvest. Candles can lend an elegant touch to these themed centerpieces. Another idea for it is to consider using an apple theme at the wedding. Place a variety of colored apples in decorative containers and use these as centerpieces. These centerpieces will be easy to create and stunning and unique to look at. Another idea for fall wedding centerpieces is to create traditional floral pieces using flowers in beautiful fall colors. Consider using orange, red and yellow roses to create your arrangements. You may also want to consider pairing one or two fall colors with white flowers for a less bold look. Simple white or cream colored flowers can be dressed up for fall with fall colored ribbons or vases. You may want to pair traditional arrangement with fall accents. Fall leaves sprinkled over the table or small pumpkins placed around can create a fall mood easily. In addition ornamental berries or berry like flowers may be able to add a fall texture to your centerpieces. Interesting fall centerpieces can also be created by using leaves and branches in your arrangements. Talk with your florist and ask for ideas about how to create beautiful fall wedding centerpieces. 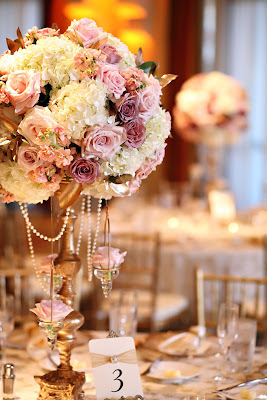 Florists are a wealth of information and will be able to easily guide you through the centerpiece creation process. Fall weddings will look beautiful if they include carefully considered fall wedding centerpieces. Look for various ideas and photographs for inspiration and begin creating a beautiful fall look for your wedding. Fall centerpieces are elegant, beautiful and unique ways to decorate your wedding celebration.